Today is the trend of social sharing and in social sharing sites, facebook sharing is used mostly by the users as everyone is on facebook. But recently I had a problem regarding sharing my content on facebook, I googled too much put failed to fix this issue, but then I found that there is facebook debugger which analyses the URL which you are going to share. Also I there were lots of guys who were getting the problem while sharing there content on facebook in which the facebook share wasn't showing post thumbnail and meta post description. I debugged my URL and founded that there was whole stuff missing in my blog Meta Tags. As per as facebook is considered there should be different meta tags used for your blogger blog. You can use it in Wordpress Blogs also. If you are getting the same problem like in your facebook content share the thumbnail is not showing or the meta post description is not showing then you should not worry about it, there are slight upgradations on facebook. All is need to fix this issue is to add some simple codes to your blog HTML. 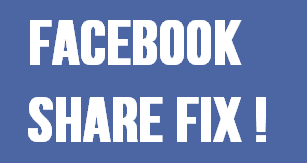 There is only one fix for this issue we have, the issue can be eliminated by adding facebook open graph protocol, when you add facebook open graph meta tags to HTML of your blog, after some time the facebook share will be working for you. I have added the whole tutorial about adding these facebook open graph meta tags to blogger in next tutorial. After the fix the there will be view like below image. please go to widget section. My Goodness have I been having issues with this for weeks! I've tried so many other things suggested on other sites/blogs on how to fix this. Some of them in very bad English (I was desperate). Finally something that worked! !